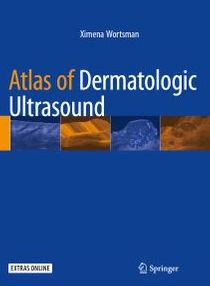 -Check the New Book "Atlas of Dermatologic Ultrasound" Just Published !!! 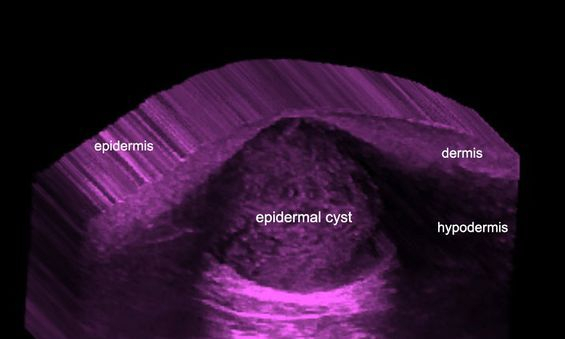 Dealing with Epidermal Cysts: Dream or Nightmare? These cutaneous cysts are generated by the implantation of epidermal components in the dermis and subcutaneous tissue. Thus, the causes can be embryonic, traumatic or secondary to surgical procedures. Epidermal cysts are covered by stratified squamous epithelium with a granular layer. Hence, the name "sebaceous cyst" is a misnomer and may be confusing. Clinically, they usually show as erythematous and sometimes painful nodules, often with a small opening on the surface, also called “punctum” which correspond to the communication of the cyst with the epidermal layer. These cysts may drain foul smelling and cheesy-like material and contain keratin, cholesterol and sometimes calcifications. One of the problems with epidermal cysts is that they can be potent simulators of other lesions, especially when the wall of the cyst ruptures and the cyst become inflamed. 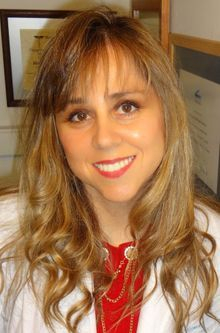 Therefore, they can mimic pilomatrixomas, dermatofibromas, foreign bodies, among other lesions. Furthermore, to prevent recurrence, the wall of the cyst (that generates the keratin) should be completely removed. 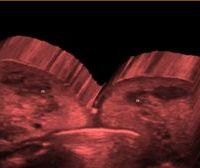 On sonography, they show a variable appearance according to the phase of the cyst. 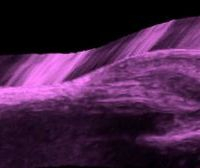 If they are intact, the sonograms will usually show a well defined, rounded- or oval shaped, anechoic or hypoechoic structure located in the dermis and subcutaneous tissue. Also, these cysts may present inner echoes (debris) and sometimes show a “pseudotestes appearance” ( ie. brighter inner echoes and anechoic filiform areas) as the result of highly compacted deposits of keratin and cholesterol. 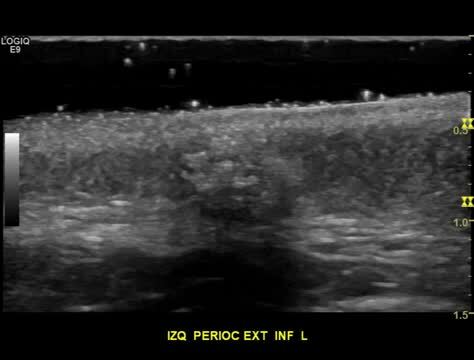 Commonly, a connecting anechoic tract (punctum) to the epidermis can be detected on ultrasound. Nevertheless, when the cyst is complicated with a rupture, the keratin is spread into the surrounding tissue and elicits inflammation and a foreign body reaction. The latter events may cause hypoechoic collections, adjacent to the cysts or a big change in the morphology of the cysts that turn into ill-defined hypoechoic structures. Interestingly, posterior acoustic enhancement, a classical artifact of the cystic lesions, is usually conserved during all the phases. 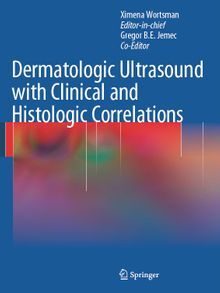 Ultrasound can show the lesion and measure the extent in all axes as well as demonstrate the connecting tracts and perform the differential diagnosis with other conditions. 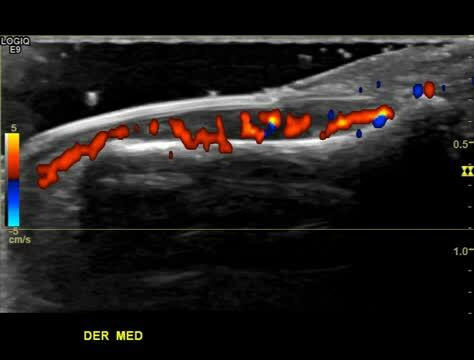 Moreover, color Doppler ultrasound may show increased blood flow in the periphery of the cysts during the phases of inflammation and rupture, frequently with low- flow vessels. The proper recognition and assessment of the extent of these cystic entities through the sum of the clinical and anatomical data provided by sonography may support an early diagnosis and proper treatment. Thus, the addition of the ultrasound technology perhaps may help to deal with these entities, turning a possible nightmare into a dream. 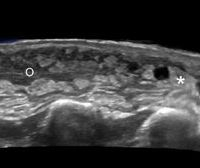 1-Huang CC, Ko SF, Huang HY, Ng SH, Lee TY, Lee YW, Chen MC.Epidermal cysts in the superficial soft tissue: sonographic features with an emphasis on the pseudotestis pattern.J Ultrasound Med. 2011;30:11-7. 3-Kuwano Y, Ishizaki K, Watanabe R, Nanko H. Efficacy of diagnostic ultrasonography of lipomas, epidermal cysts, and ganglions. Arch Dermatol. 2009 ;145:761-4. Pilomatrixomas: Masters of Disguise ? Pilomatrixomas, also called pilomatricomas or calcifying epitheliomas of Malherbe are common and benign skin tumors that arise from the hair follicle matrix. These conditions are more common in children and young adults, especially on the head, neck and extremities. Clinically, they usually present as single or multiple painless, erythematous or slightly bluish nodules. Thus, these tumors can easily mimic other cutaneous lesions such as epidermal cysts, foreign body reactions, fat necrosis, calcified lymph nodes or vascular tumors, among others, on the clinical examination. Moreover, clinical misdiagnosis has been reported as high as 54% in some series. 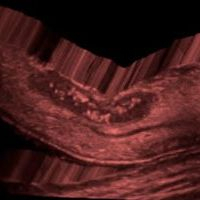 On sonography, pilomatrixomas classically appear as target-shaped nodules with well-defined hypoechoic rim and hyperechoic center. 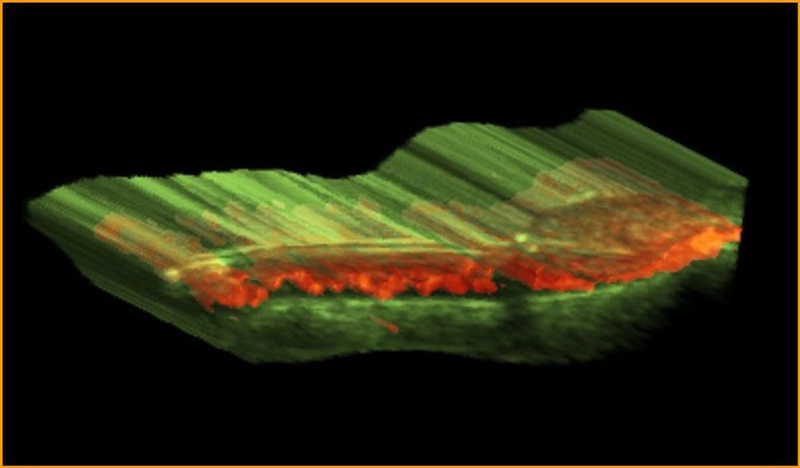 Scattered hyperechoic dots producing posterior acoustic shadowing that correspond to calcium deposits may be found within the nodule nucleus (partial calcification). Nevertheless, 15 to 30% of pilomatrixoma cases had been reported to not show calcium and 45 % of these entities, in other series, had been reported as completely calcified. Furthermore, there are rare cystic variants of pilomatrixomas. 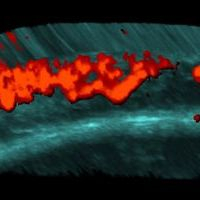 On the other hand, variable degrees of vascularity can be present within the tumor which may also explain the challenging clinical diagnosis. Ultrasound had reported correctness of diagnosis from 76% to 96% and provides reliable information about the extension, location and blood flow of the lesions. Therefore, a pre-surgical sonographic examination may be a good tool for removing the clinical disguise of these tumors. 1-Roche NA, Monstrey SJ, Matton GE. Pilomatricoma in children: common but often misdiagnosed. Acta Chir Belg. 2010 ;110:250-254. 2-Kumaran N, Azmy A, Carachi R, Raine PA, Macfarlane JH, Howatson AG. Pilomatrixoma--accuracy of clinical diagnosis. J Pediatr Surg. 2006 ;41:1755-1758. 3-Choo HJ, Lee SJ, Lee YH, Lee JH, Oh M, Kim MH, Lee EJ, Song JW, Kim SJ, Kim DW. 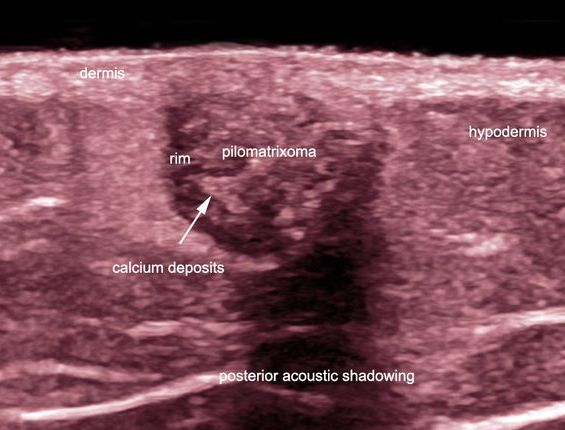 Pilomatricomas: the diagnostic value of ultrasound. Skeletal Radiol. 2010;39:243-250. 4- Solivetti FM, Elia F, Drusco A, Panetta C, Amantea A, Di Carlo A. Epithelioma of Malherbe: new ultrasound patterns. J Exp Clin Cancer Res. 2010 6;29:42. 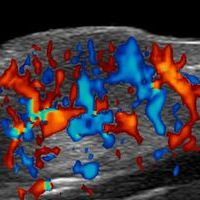 5-Wortsman X, Wortsman J, Arellano J, Oroz J, Giugliano C, Benavides MI, Bordon C. Pilomatrixomas presenting as vascular tumors on color Doppler ultrasound. J Pediatr Surg. 2010;45:2094-2098.